The recreational bottomfish (a.k.a. 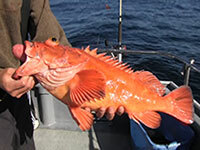 groundfish) fishery is open at all depths through March, with the exception of the Stonewall Bank Yelloweye Rockfish Conservation area, approximately 15 miles west of Newport, which is closed to bottomfish and halibut fishing year round. 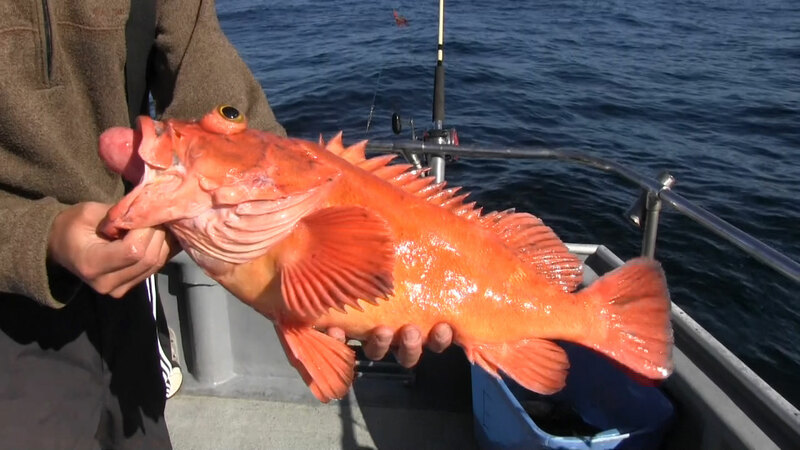 Yelloweye Rockfish with symptoms of barotrauma. Beginning Jan. 1, 2017 vessels fishing for bottomfish will be required to have onboard a functioning rockfish descending device, and use it to descend any rockfish released when fishing outside of the 30 fathom regulatory line. ODFW continues to encourage anglers to use a descending device when releasing any rockfish with signs of barotrauma. Signs of barotrauma, such as bulging eyes and a gut protruding from the mouth, are reversible when fish are returned to depth with a descending device. 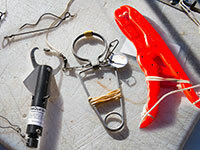 Use a descending device to safely return fish to a depth of 60 feet or more. Even fish that are severely bloated can survive after being released at depth. For more information and videos, please see the rockfish recompression webpage. New bag and sub-bag limits for 2017: To stay within Federal allocations, and try to provide for year-round fishing opportunities, there are some changes to daily bag limits. Canary rockfish has rebuilt and is now part of the regular 7 fish marine bag limit (no sub-bag limit). Black rockfish will have a sub-bag limit of 6 fish (out of the 7 fish daily bag, no more than 6 may be black rockfish). There is a 4 fish sub-bag limit for blue/deacon, China, copper, and quillback rockfish combined (out of the 7 fish marine bag, no more than 4 may be these species combined). The bag limit for lingcod remains at 2 fish and flatfish species, other than Pacific halibut, remains at 25 fish. Several handouts, including “What Can I Keep, and How Many?” (Updated for 2017) and species identification tips, are available on the ODFW sport bottomfish webpage. Reminder the Cabezon season closes December 31, 2016. It will reopen July 1, 2017.